General motion control (GMC) is a type of motion control. In a GMC based motion controller, the velocity, position, torque, acceleration, etc. of machines are controlled using an appropriate machine/device. The device used could be a linear actuator, an electric motor (servo), or a hydraulic pump. GMC-based motion controllers have witnessed significant growth during the last two decades due to rising demand for plant automation to achieve greater equipment efficiency and rising concerns regarding industrial safety. There is a great demand for GMC-based motion controllers in the semiconductor and electronics industry due to the advancement in processing speed, precision, and reliability of motion controllers. In recent times, multi-axis motion controllers are used for movement and for controlling the position of composite functions. In 2017, the global GMC-based motion controller market was valued at US$ 817.1 Mn and is anticipated to reach US$ 1,542.7 Mn by 2026, expanding at a compound annual growth rate of 7.4% during the forecast period from 2018 to 2026. The ongoing industrialization in developing markets demands greater safety measures to check fatal accidents. Motion controllers are widely used in textile, assembly industries, printing, packaging, semiconductor production, and many other automation systems. More than one million workers die due to occupational accidents every year globally. Therefore, due to stringent regional government policies, safety has become aprimary concern in the field of industrial automation. Hence, increasing demand for GMC based motion controllers from different industries to ensure safety of workers is anticipated to create opportunities for GMC based motion controllers in the near future. The market for GMC-based motion controllers is expected to grow during the forecast period with the advancement in technology and increasing number of manufacturers of GMC-based motion controllers. In recent years, companies are coming up with new innovations in the field of PC based software systems. The new highly integrated PC-based software that serves as an ideal GMC based motion controller can change a conventional Windows PC into an industrial-strength unit for visualization and control. Furthermore, precision, speed, and reliability are important to packaging applications. The value of packaging machines is more when the product is packaged at a faster rate. Most companies provide several motion control products that help packaging machine designers achieve superior performance. The packaging industry is expected to grow at a significant rate and will remain the biggest end-user for motion controllers. The market for GMC-based motion controllersis expected to surgedue to these factors. However, increasing complexity and demand for highly reliable GMC based motion controllers is likely to be the limiting factor for the growth of the market. Consumers are concerned about highly reliable products in terms of speed, accuracy, improved efficiency and consistency, integrated automation, fast reaction time, cost reduction, smooth movements, elimination of hazards, and better diagnosis and troubleshooting among others. Hence, manufacturers are facing challenges to ensure efficient applications of GMC based motion controllers which is likely to hamper the growth of the GMC based motion controller market over the forecast period 2018-2026. With the objective of expanding the market and meeting the demand, a number of players are increasing their offerings through strategic mergers & acquisitions and partnerships. Some of the prominent players identified in the GMC-based motion controller market includes - ABB Ltd., Allied Motion Inc., Delta Electronics, Inc., Fuji Electric Co. Ltd, Mitsubishi Electric Corporation, National Instruments, Inc., Omron Corporation, Rockwell Automation Inc., Schneider Electric S.E., Siemens AG, Toshiba Corporation, YASKAWA Electric Corporation, and Yokogawa Electric Corp. This comprehensive report by Transparency Market Research analyzes and forecasts the GMC-based motion controller market at the global and regional level. The report provides analysis over the period 2016–2026, wherein 2018 to 2026 is the forecast period and the base year is 2017. An in-depth and unbiased market assessment has been made to offer readers in-depth and accurate analysis. 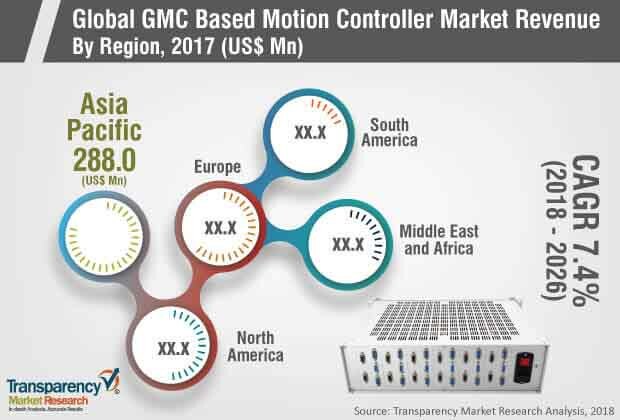 The report emphasizes on all the major trends and services playing a key role in the growth of the GMC-based motion controller market during 2018 - 2026. It also focuses on market drivers, restraining factors, and opportunities of the GMC-based motion controller market during the said period. The study provides a complete perspective about the growth of the GMC-based motion controller market throughout the research study in terms of value (in US$ Mn) and Volume (Thousand Units) across various geographies, including North America, Europe, Asia Pacific, Middle East & Africa (MEA), and South America. The report includes a detailed value chain analysis, which provides an extensive view of the global GMC-based motion controller market. The Porter’s Five Forces analysis provided in the report helps to understand the competitive scenario in the market. The study incorporates market attractiveness analysis, wherein the market segments for product, technology, and application are benchmarked based on their market size, growth rate, and attractiveness in terms of opportunity.In order to give a complete analysis of the overall competitive scenario in the GMC-based motion controller market, every geographic region mentioned in the report is provided with attractiveness analysis. A market overview chapter explains the market trends and dynamics that include the market drivers, restraining factors, and opportunities for the current and future GMC-based motion controller market. Market outlook analysis has been provided globally in the report. Additionally, the report also provides analysis of different business strategies being adopted by market leaders of the GMC-based motion controller market. Market introduction chapter assists in gaining an idea of different trends and services related to GMC-based motion controllers. The study provides a decisive view on the global GMC-based motion controller market, by segmenting the market in terms of type of axis, product, precision, network communication, and application. The report provides a detailed breakdown of the GMC-based motion controller market region-wise and categorizes it at various levels, thus providing valuable insights at micro and macro levels. The report further highlights the competitive scenario within the GMC-based motion controller market, thus ranking all the major players according to key recent developments and their geographic presence. The insights for the GMC-based motion controller market are the result of our extensive primary interviews, secondary research, and in-house expert panel reviews. These market estimates have been analyzed by considering the impact of different economic, political, social, legal, and technological factors. On the basis of country, the North America market is bifurcated into Canada, the U.S., and Rest of North America. Furthermore, the Europe market is analyzed across France, Germany, U.K., and France. The APAC GMC-based motion controller market is also segmented at country level which includes China, Japan, South Korea, and Rest of Asia Pacific. Middle East & Africa region covers the GCC, South Africa, and Rest of Middle East & Africa. Similarly, South America region includes Brazil and Rest of South America. The report provides all the strategic information required to understand the GMC-based motion controller market. The report also provides insights related to the components and different applications according to the various geographical regions mentioned above. Primary research involves telephonic interviews, e-mail interactions, and face-to-face interviews for detailed and unbiased reviews on the GMC-based motion controller market,across geographies. Primary interviews are usually conducted on an ongoing basis with industry experts and participants in order to get latest market insights and validate the existing data and analysis. Primary interviews offer new and fresh information on important factors such as market trends, market size, competitive landscape, growth trends, etc. These factors help to validate and strengthen secondary research findings. Moreover, the data collected and analyzed from secondary and primary research is again discussed and examined by our expert panel. The research study includes profiles of leading companies operating in the global GMC-based motion controller market. Market players have been profiled in terms of attributes such as company overview, financial overview, business strategies, and recent developments. The key players profiled in the global GMC-based motion controller market includes ABB Ltd., Allied Motion Inc., Delta Electronics, Inc., Fuji Electric Co. Ltd, Mitsubishi Electric Corporation, National Instruments, Inc., Omron Corporation, Rockwell Automation Inc., Schneider Electric S.E., Siemens AG, Toshiba Corporation, YASKAWA Electric Corporation, and Yokogawa Electric Corp.Companies are focusing on expanding their business through strategic acquisitions and partnerships with several end-use industries.